Texas Democratic Congressman Beto O'Rourke at a January town hall meeting in Alice, Texas. In his long-shot bid to unseat Sen. Ted Cruz, O'Rourke has campaigned in at least 226 of the state's 254 counties. 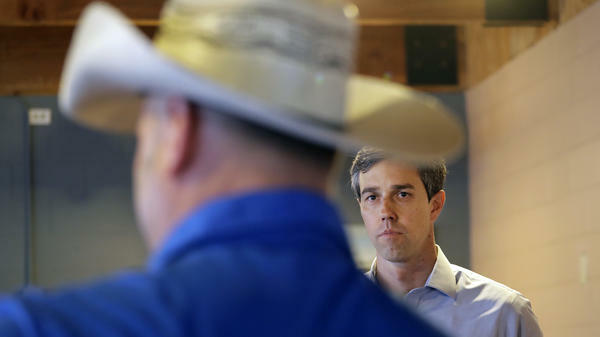 Rep. Beto O'Rourke, the Texas Democrat challenging Sen. Ted Cruz's re-election bid this year, speaks to voter Mike Nichols at an event in Pittsburg, Texas. More than 100 people showed up to the event, in a town of just over 4,700. 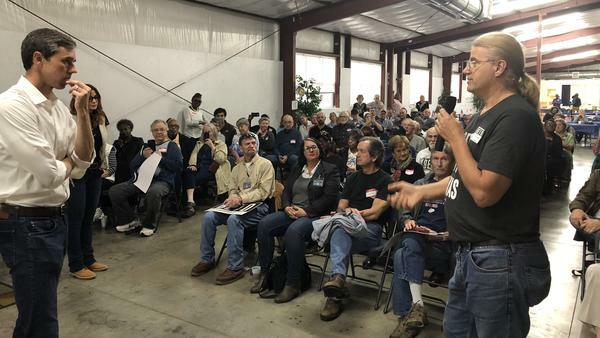 Rep. Beto O'Rourke, D-Texas, campaigns in Pittsburg, Texas. In his race against Sen. Ted Cruz, the congressman has been seeing momentum in crowds and small dollar donations. The rain's coming in sheets as folks file into the Douglas Community Center in Pittsburg, Texas, population 4,707. The organizers of an event for Democratic Senate candidate Beto O'Rourke have set out 50 chairs, but they're worried now that's going to be too many. But by the time the candidate bounces through the door, they're unfolding dozens more chairs as the crowd zooms past 100. O'Rourke, who currently represents the El Paso area in the U.S. House, is running for the chance to unseat the Republican incumbent, Ted Cruz. No Democrat has represented the Lone Star State in the Senate since 1993, but O'Rourke believes he can beat the odds, in part by campaigning aggressively in every part of this sprawling state. "Of the 254 counties [in Texas], we've visited 226 so far. This is 226 today," O'Rourke tells the crowd, who have been chanting, "Beto, Beto!" O'Rourke has his work cut out for him. A recent Texas Politics Project poll showed nearly 40 percent of Texas voters have no idea who he is. But county by county, O'Rourke is slowly getting his name out with crowded, grass-roots events like the one in Pittsburg. "I love Beto, I came out to see him. I've probably seen him eight times. He stands for everything that Ted Cruz doesn't and I think he's the real deal," said retired teacher Barbara Rosel. O'Rourke's substantial fundraising has also drawn notice. "In the first 45 days of this year we raised $2.3 million with an average online contribution of 25 bucks," said O'Rourke as he spoke to NPR while sitting down for lunch at a Pittsburg restaurant called Hot Links. Cruz raised about $800,000 during the same period. "I just haven't seen this kind of excitement and energy and willingness to do what it takes in Texas in my life," O'Rourke added. That fundraising may help him make up for the lack of awareness Texas voters have of the Democrat, according to Texas Tribune executive editor and political analyst Ross Ramsey. "I think he'll have enough money, whether they vote red or blue in November, Texans will know who Beto O'Rourke really is," Ramsey told NPR. O'Rourke is capitalizing on an extremely restive Democratic electorate. Although Texas Democrats have been largely shut out of statewide office for the past two decades, they've been closing the gap with Republicans. In 2016, Hillary Clinton got 600,000 more votes in Texas than Barack Obama did just four years earlier. President Trump won the state by about 9 percent. O'Rourke says the president has a lot to do with the energy among Democrats. "They're coming out because they don't want a wall [with Mexico]. People are coming out because they don't want to hear the president refer to the countries of Africa as 's***hole' nations," said O'Rourke. "People are coming out because they don't think the press is the enemy of the people, they think they're the best defense against tyranny. People are coming out because they want women to be treated with dignity and respect." The tall, thin 45-year-old sometimes gets described as a West Texas version of John F. Kennedy. But it's O'Rourke's unabashed liberalism and earnest delivery that makes Democrats swoon. At the Pittsburg event, O'Rourke criticized the state's decision to shut down family planning clinics, arguing it has resulted in sky-high maternal mortality rates. In a state where guns are sometimes seen as a birthright, he argues for universal background checks and an assault weapons ban. O'Rourke has two challengers in this Tuesday's Democratic primary, but had a 50 point lead in the latest polling. This fall, it's likely O'Rourke will face Ted Cruz in the general election. Although Cruz's reputation with Republican voters suffered when he refused to endorse Donald Trump's nomination at the 2016 Republican National Convention, he is an accomplished fundraiser and formidable opponent. Cruz's campaign did not respond to requests for comment, but Cruz is taking the race seriously. He recently warned Houston-area Republicans: "The left is going to show up. They will crawl over broken glass in November to vote." Early voting numbers in Tuesday's Texas primaries show that Democrats have more than doubled their numbers from the same point in the 2014 midterms, while Republicans are up only 15 percent, according to David Wasserman of the Cook Political Report. Ramsey warns that it's easy to read too much into early vote totals, since they may just indicate Democrats are taking advantage of the convenience of early voting. The final turnout on Tuesday will be a better indication of where things sit. "It's still a Republican state. It would take a lot of things to fall in place, but that said, up to this date O'Rourke has a lot of things going for him," Ramsey said. He added that many Texas political observers are reminding themselves that they saw the rise of another long-shot Senate candidate six years ago. His name was Ted Cruz. In Texas, a Democratic congressman is gaining momentum in his longshot effort to unseat Senator Ted Cruz. NPR's Wade Goodwyn traveled to East Texas to learn why El Paso Representative Beto O'Rourke thinks he can beat the odds. WADE GOODWYN, BYLINE: The rain's coming in sheets as folks file into the Douglass Community Center in Pittsburg, Texas, population 4,707. UNIDENTIFIED WOMAN: I'll tell you. It's almost like you had to swim in, huh? GOODWYN: The organizers of this Beto O'Rourke event have set out 50 chairs, but they're worried now that's going to be too many. But by the time the candidate bounces through the door, they're unfolding dozens more chairs as the crowd zooms past 100. O'ROURKE: Yo, thanks for coming out. Thank you. GOODWYN: O'Rourke has his work cut out for him. A recent Texas Politics Project poll showed nearly 40 percent of Texas voters had no idea who Beto O'Rourke is. But county by county, O'Rourke is slowly changing that. O'ROURKE: Of the 254 counties, we've visited 226 so far. This is 226 today. GOODWYN: A few minutes earlier at a Pittsburg restaurant called Hot Links, the candidate has a few minutes for lunch. It's not O'Rourke's tirelessness that's drawn media attention; it's the turnouts for his campaign events and prolific fundraising. O'ROURKE: In the first 45 days of this year, we raised $2.3 million with an average online contribution of 25 bucks. In that same time, the sitting junior U.S. senator who does take PAC money and has a national fundraising base raised $1.5 million less. I just haven't seen this kind of excitement and energy and willingness to do what it takes in Texas in my life. GOODWYN: O'Rourke is capitalizing on an extremely hungry Democratic electorate. While it's true that Texas Democrats haven't elected a candidate for statewide office in nearly 25 years, they're getting closer. In 2016, Hillary Clinton got 600,000 more votes in Texas than Barack Obama did just four years before. That was an eye-opener. And O'Rourke says President Trump has been throwing fuel on this fire. O'ROURKE: They're coming out because they don't want a wall. People are coming out because they don't want to hear the president refer to the countries of Africa as [expletive] nations. People are coming out because they don't think the press are the enemy the people; they think they're the best defense against tyranny. People are coming out because they want to make sure that women are treated with respect and dignity. 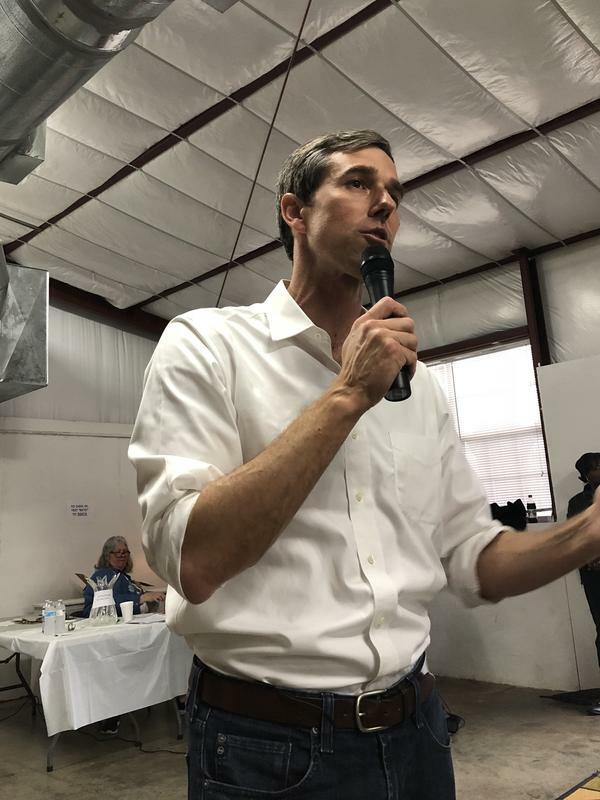 GOODWYN: The tall, thin, 45-year-old O'Rourke sometimes gets described as a West Texas version of Jack Kennedy, but it's O'Rourke's unabashed liberalism and earnest delivery that makes Democrats swoon. O'ROURKE: Texas now leads the developed world in the rate of maternal mortality, as we have closed down so many family planning clinics, made it so hard for women to get a cervical cancer screening, see a family planning provider. We're losing them at an alarming rate. When it comes to gun safety - universal background checks without exception for every American who wants to purchase or own a gun, and let's stop selling military-grade weapons to members of the public. GOODWYN: O'Rourke has two Democratic primary challengers, but the closest is more than 50 points back in the latest polling. It may end up being Beto O'Rourke against Republican incumbent Ted Cruz. Although Cruz was damaged a bit when he refused to endorse Donald Trump at the Republican National Convention, he's a smart campaigner, accomplished fundraiser and formidable opponent. His campaign did not respond to requests for comment, but Cruz is taking this race very seriously, recently warning Houston Republicans the left is going to show up. They'll crawl over broken glass in November to vote. Wade Goodwyn, NPR News, Pittsburg, Texas. Transcript provided by NPR, Copyright NPR.